Conditionals can be a confusing aspect of the English language to grasp for both ESL and native speaking students. However, like many other aspects of second language acquisition, the concept can be considerably more difficult for ESL students. Different languages approach conditionals in different manners, so ESL lessons that address conditionals will be interpreted differently by students depending on their native language. The following sections cover the concept of conditionals and suggest teaching strategies that could be implemented for your students. Conditionals are sentence structures that explain a particular situation or circumstance and its consequences. If this happens, then that happens. Conditionals are commonly referred to as "if sentence structures" because they often contain the word "if." There are four main conditionals that are commonly used in the English language: first conditional, second conditional, third conditional and zero conditional. The first conditional deals with issues that have a real possibility of occurring. This conditional typically deals with future, real world events that are pondered on a daily basis. When people make plans and suggest back up plans, they are utilizing the first conditional. If I can get the time off of work, then I will come visit you in Baton Rouge. If we burn the dinner, we may have to order pizza. I can work from home, if my Internet connection gets fixed. If it rains tomorrow, I shall go to the movies. The second conditional is a bit more tricky. In some ways it is similar to the first conditional. It utilizes the same if/then structure, but instead of using the words will, shall, can, or may, the second conditional uses would, could, or might. The most significant difference between the second conditional and the first conditional, however, is that the second conditional deals with events that are not real possibilities. In many cases, the events could happen; they are not physical impossibilities. However, they are not tangible events that are certain to impact daily life. If I had a million dollars, I might open an animal sanctuary. If we lived in Spain, we would enjoy the siestas. If I became president, I could do away with the penny. While the first two conditionals talk about possible future events, the third conditional deals with the past. Specifically, the third conditional talks about events in the past and ponders the effects of those events not happening. If Bobby Kennedy hadn't been assassinated, he would have made a great president. If I had bet on the long shot, I would have made a killing. If I had married her when I had the chance, I would have been happy. If you don't ever water your plants, they die. 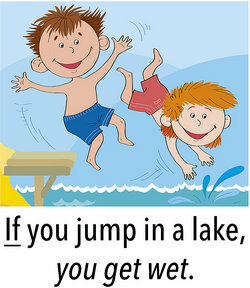 If you jump in a lake, you get wet. If it gets below freezing, water turns into ice. If you stick your hand in a fire, it burns. When teaching conditionals for ESL students, it is most useful to construct your lessons so they follow a logical progression through the four conditionals. Start with the first conditional, and make sure you provide ample time for students to fully grasp the concept before moving on to the second. Simple assessment tools, like quizzes or games should be implemented after each lesson to make sure that the students truly understand the concepts you are covering and are not just nodding in agreement. This process is useful for all student populations, but particularly for ESL students who may require additional time and practice to fully grasp some of the more obtuse concepts. Be as flexible as possible with your schedule, and move on when the students are ready. "Teaching Conditionals for ESL." YourDictionary, n.d. Web. 22 April 2019. <https://esl.yourdictionary.com/lesson-plans/Teaching-Conditionals-for-ESL.html>. Conditionals can be a confusing aspect of the English language to grasp for both ESL and native speaking students. However, like many other aspects of second language acquisition, the concept can be considerably more difficult for ESL students.Different languages approach conditionals in different manners, so ESL lessons that address conditionals will be interpreted differently by students depending on their native language. The following sections cover the concept of conditionals and suggest teaching strategies that could be implemented for your students.